Kitchen Floor Designs..... When it comes to interior design, the kitchen floor is one of the most visible elements in a kitchen, so make sure it has the impact you desire. No matter what type of floor you install, choose your colours, patterns and textures carefully as what you choose as the final look, can make all the difference in the perception of space. 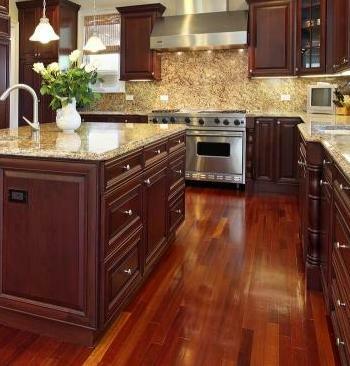 When well chosen, the kitchen floor can serve as a bold, eye-catching design statement. The kitchen floor is usually the largest area in a kitchen; so your selection of material will make all the difference to the perception of space. Imagine a dark, dull floor in a small kitchen; It will make the room seem small, dark and dingy. However, the same space with a white-painted wooden floor will look airy, light and appear bigger than it really is. In a small space, pattern, too, can have a major impact on the perception of space and light. Patterns and textures shouldn't compete with your desired focal points. Build your kitchen cabinets on stilts. This way the flooring can be seen to continue underneath the cabinets and it seems as if the floor extends into an adjacent space. The best kitchen flooring choice will be one that flows with the existing flooring from the rest of your home in either colour and style; by blurring the boundaries, your kitchen will display bigger than what it actually is. Because floors flow from one room to the next, your kitchen floor design is the ideal medium for creating continuity and flow throughout your home. Remember that this does not mean you have to use the same floor covering in every room; it just means that you repeat certain patterns, textures or colours from one room to the next. Through careful planning, you can select a pattern or design that you can repeat throughout the kitchen and adjacent rooms. Perhaps because the kitchen floor is the largest surface in the kitchen, it presents a rather daunting challenge for us DIYers that don't do it that often. So in most of our homes, floors are muffled in one type of floor cover and disappear into the background. 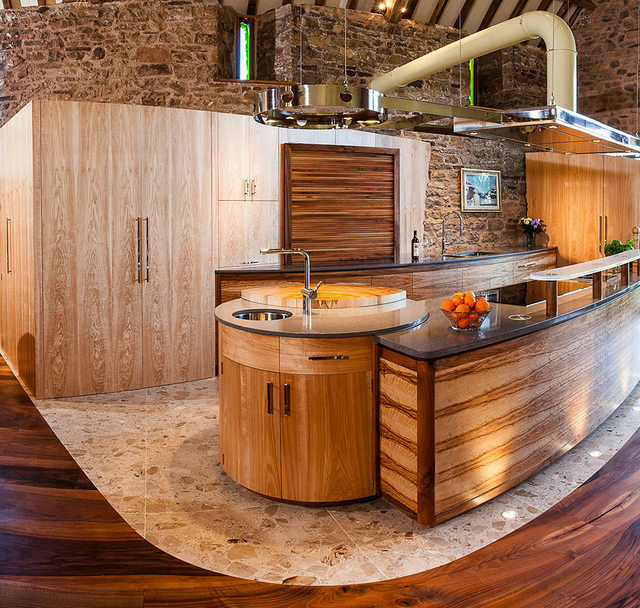 But with some imagination and skillful design, floors in any kitchen can become a truly beautiful asset. When you have the luxury of a large open-plan kitchen, then this statement holds true..... You have all this space, but it can be quite difficult to know what to do with it? The perfect kitchen floor is an integral component of any kitchen design, and a well-chosen floor covering, whether it be ceramic tiles, wood or laminates, will interact with the other design elements in the kitchen. all in one universal space, then flooring can be your answer. It gives you the opportunity to bring it all together, while also showing that this one room has different functions. 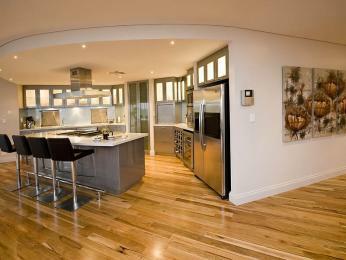 By using different flooring materials in different parts of the kitchen, you can divide the space clearly, yet subtly. No need for walls or other major construction to indicate the different spaces. 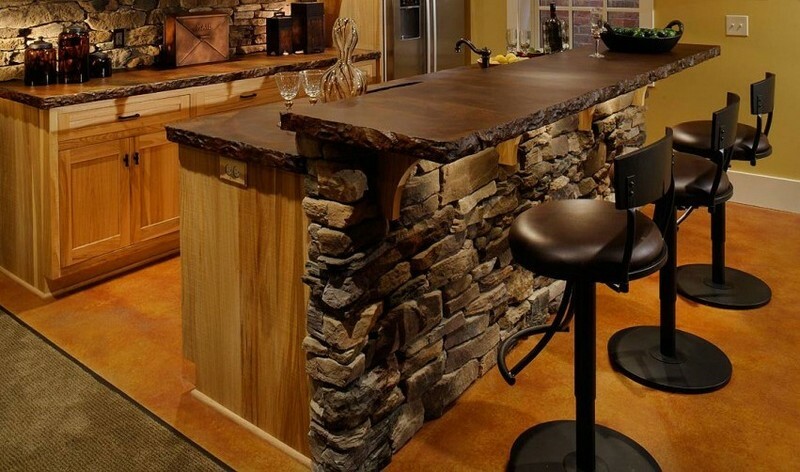 The most effective way to define the different spaces in a kitchen is to raise the level of the floor in one area to separate a particular zone from another. By stepping up to the dining area, you feel as if you are entering a different space. Leaving the "work area" behind and entering the relaxation area; where you can enjoy a delicious meal with your family and friends after a long tiring day. how to prepare the ground, so that your new kitchen floor will be stable and secure for many years to come.